The biggest preparedness challenge some of us will face is convincing our loved ones to get on board with our preparedness planning. Whether it’s convincing your immediate family about the importance of prepping or talking to extended family and friends about why they need to prepare, the conversation is something we need to have if we really care about our loved ones. 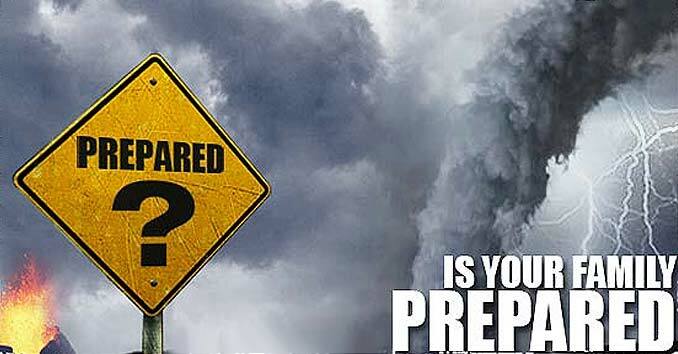 This one is really a no-brainer; to truly be prepared for disasters, crisis, and threats, your immediate family needs to be on board with your plans. It’s the only way you can ensure their safety. The best thing you can do for a spouse who might not understand your reasoning is to simply open up and communicate your concerns. Share examples of past disasters, and try to make it as relatable and personal as possible. Explain to your spouse how it’s no different than buying health, life or car insurance. You’re basically taking out an insurance policy against future disasters. Start slow, and don’t start with worse case scenarios – even if that’s what you’re preparing for. Ease them into the idea. Explain to them that it’s also about preparing for things like a job loss, a loss of income, or an illness that could cause you to have to take time off of work. Keep it simple and age-appropriate. The last thing you want to do is over complicate things or cause your children unnecessary stress. Focus on things that make sense to them, and try to relate to them using experiences that they can understand. Talk about what they would do if a disaster hit while they were at school. Take it slow. Try to work the topic into everyday conversations and make sure you involve them and ask for their feedback. Take the time to point things out when you’re out and about. Help develop their situational awareness; point out things like exits in stores, and ask questions on how they would respond to certain situations. When it comes to talking to extended family or friends about preparedness, the importance of raising the topic comes down to how much you care. While convincing them isn’t necessarily going to affect your efforts one way or the other, it is good to know the ones you care about are prepared to take care of themselves during times of crisis. On the more selfish side of things, convincing the ones you care about to become more self-reliant also helps to ensure they won’t show up on your doorstep during a disaster, expecting you to take care of them. Things you can do to convince your friends and family to prepare. Give them the gift of preparedness. Give them something small like a vehicle preparedness kit or a first aid kit as a way to open the conversation and help change their mindset. It’s also something they can easily wrap their minds around and can help get them thinking about what else they might need. Give them a book. A book is a great non-threatening way to introduce the subject. Shameless plug alert: The Ultimate Situational Survival Guide is now available on Amazon and Barnes and Noble. It covers just about every type of disaster, threat, and crisis your loved ones will ever face. Use what’s in the news. When there’s a disaster in the news, use it as a way to bring up the topic. Don’t go overboard, but try to get the conversation started and try to get your friends or family thinking about what they would do in that situation. No matter how hard you try, there are some people who are never going to see things your way. As much as that may hurt, especially when it’s someone you really care about, you may have to just let things go and hope for the best. In the end, there’s only so much you can do or say; if someone refuses to care about their readiness to face disasters, be satisfied that you’ve done what you can and then move on and focus on yourself and your immediate family. Hungry dogs began running in packs, which was crazy! This was the worst case scenario and I saw it first hand, most people were no prepared even a little bit. I wish I could make my wife and family understand but I don’t think they will until it happens to us. I likely the analogy of boiling the frog. Yes it can be a good thing:) You have to start slow. Little bits of info, clever gifts. Not just gifts actual prepps. Christmas is a golden opportunity. Don’t buy them electronic junk. Who knows once they get the bug they may even want to go to the range with you. I’m another one of those trying to prepare, with a wife that thinks it’s nuts. In fact every time I bring it up she looks at me like I have 3rd appendage growing out of my forehead. My 2 older kids (18 and 21) they understand it. I can’t tell you how frustrating it is to try to prep when your spouse is resistant to it. At the end of the day though I just go ahead and do it anyway, she knows I’ll do what I decide regardless of what any one says. Besides it’s easier to ask forgiveness than permission. One thing I’ve done from time to time is sell some things as camping equipment, though that’s starting wear a little thin with her too. John, you are an idiot! Joe, call your family together and have them sit around the table. Dust off your Bible…yes, the Bible…and open it to the book of Genesis, chapter 41 and verse 25. Read aloud the rest of the chapter and then explain to your family that you are trying to be the best husband and father you can be, with God’s help, even if no desaster ever comes upon them. Then sit there quietly and let the Scriptures sink in. No argument. God doesn’t need you to defend Him. It is biblical, and it is honorable! First and foremost, this is a great resourceful website! I’ve been thinking about the subject for a few years now and made the decision to prep about 4 months ago. My wife is interested in public health issues and disaster preparedness, so she doesn’t think I’m totally crazy when I bring up the subject. I am very cautious about bringing the subject up to family, friends, and neighbors, and co-workers. We maintain a basic food and water supply with core essentials but have invested pretty extensively in a bug out bag and have an evacuation plan if SHTF in our urban environment. We love city life, but acknowledge that it is not sustainable during a disaster. Survival and preparation will certainly be factored into our next home buying decision. I find it so ironic about you husbands with non-prepping wives. I am a prepping wife with a husband that thinks I’ve went off the deep end. Learner, don’t I know it! My husband seems to be slowly getting on board, and my family just seems like they are humoring me at times, but they DID buy me prepping supplies for Christmas, so maybe I am getting through. My main issue is being able to physically move, store, plant, harvest, build etc after being diagnosed with Fibromyalgia :( I NEED their help, so I will continue to educate them as best I can! Sometimes words get in the way. Your actions are the best form of communication. Gardening is something people have done since the dawn of civilization. You don’t have to have an excuse because you’re decided to plant tomatoes. When your harvest is so abundant that the family can’t eat it all, the next logical step is to preserve it to be consumed at a later time. No one thinks much about something they see all the time. The things you do are just what you’re into. Sewing your own clothing is not extraordinary. Children naturally want to learn. So you start teaching them how to do for themselves. Let them plant some strawberries and watch them come alive. When they put that delicious berry in their mouth that came from the plants they put in the dirt a new recruit is born. Give them a chance to help you in the kitchen while you prepare their food from scratch. The same goes for spouses. Get them involved, even if it’s just as a consumer. I plant fruit trees where ever I live. Long before I ever heard the term survival or prepper I learned from my parents who always had fruit trees and berries. My Dad picked out a little spot in the yard and planted lettuce and other things for a salad. It wasn’t a big production. We still went for groceries at the supermarket. But I learned from seeing it done, that just about anything can be repaired. I learned to take care of what I had. I learned that quality is more important than quantity in most cases. I learned to survive, and to prepare without words. I think that’s the best way to teach, just live it. At first my Wife was not too concerned with being prepared. Over time though after bringing it up in certain ways, its mostly communication and don’t get all up in arms if they don’t immediately jump on board, finesse is key. The way I approached it first is from the natural disaster aspect, it’s unpredictable and we all experienced power outages at some point in our lives, and the outcome is usually purchasing a generator. So I let her know that for natural disasters FEMA recommends two weeks of food and water and has been known to say up to three months, but little steps first. So with a credible source FEMA (I guess) but that’s ok, what ever it takes, so she was more relaxed with me getting some extra things when we go food shopping. Over the next few months introduce slowly survival shows, like Alaskan bush people, or Live free or die, those are reality shows, but who cares, it puts the mind in a certain mind set and she, while not fully as interested as I am, is more understanding and feels a comfort that we are doing this for the whole family just in case. Would I like more stuff faster, YES! but I can also have patience, that goes a long way. Next on the list is a firearm, and that talk has gone over much smoothly since watching those shows. B from CA, I like the gardening aspect, we are going to have a full garden come this spring. I like to grow hot peppers the really hot ones like ghost chili. Also I am starting with blueberries and peaches. Another good thing is to know the wild plant life in your area, I point these out to my 4 yr old and she knows how to identify at least four different wild edible plants and has eaten them with me. One thing concerns me greatly. OPSEC (operational security). Whenever I talk to loved ones who scoff at the idea of prepping, I am often told “I know where I’m coming if desaster strikes”. I don’t want to tell them to stay away or they might get shot, especially if it’s the Pastor. Tell them that the chances of them even being able to get to your place are next to nil. And tell them that you already have family coming and wouldn’t have room for more than what you have planned for, so that is why they should plan for themselves. Just a thought…. Its hard convincing friends, but recent events helped, and the government warning on the “Big One” a forecast of an earhtquake that may hit us when a major fault traversing our metro moves. To help develop awareness in my family, I oriented my kids first, involving them in more fun activities like camping, eventually making them aware of its disaster preparedness use. Now they are well informed, my son now is a volunteer in the local red cross. I took this as an advocacy, putting up an FB page, Third World Prepper and Survivalist and Urban Preppers. I agree about disaster prep. l plan to start the “talks” with fam on a new level soon. As of now, everyone from my mom to my 13 yr old daughter is sure that I believe/have at least a few “un-realistic conspieracy theories”. Thanks for above advice, option to start slow, without worst case scinereos will truly work wonders, be my best start! Let’s keep informing the people on how we need to ACT NOW,! (b4 we can not act) We must not be violent ourselves, but come together as 1, for us all, to keep our rights, freedoms, homes,ect. We need to rid those in office whom are not for the people, but personal agendas. There are police, many, all around our nation, killing unarmed people, even teens/WHOM ARE CHILDREN! WITH NO CONSEQUENCES EXCEPT A PAID VACATION, -a.k.a.- “paid administrative leave while investigation is being conducted”. Most are not fired, held accountable, charged or indicted! And I have no idea how our president has not been impeached! … What about when he took it upon himself to release/ or “exchange hostages” WITHOUT SOLE AUTHORITY TO DO SO! While he should have took no action, as the idea proposed had to be approved by congress … And the “exchange of hostage(s)” included 5 terrorist leaders in exchange for 1 prisoner from the US, taken approx 5-10years prior, whom was accused of being a traitor to US, just prior of being “taken hostage” years before. Obama felt it SO necissary to bring back & put on trial 1 whom allegedly switched sides while deployed over seas,that he- ILLEGALLY, (UNWANTED by most) FREEED TERRORIST LEADERS BACK overseas! … How was this done/allowed/unpunished& not spoken of much afterwards?!?!?! How are those actions done by the leader of our nation and that man is still the leader of our nation?! HOW DOES THE PROCESS OF IMPEACHMENT START? !- OR WHY WAS HE NOT “PUT ON PAID LEAVE WHILE INVESTIGATION CONDUCTED” OVER what I would think could be nothing shy of “aiding terrorists/making him #1 on suspected terrorist threat list?!?!?! Maybe I’m missing alot of info from my knowledge on this matter, idk. But the little info I saw 1st hand on news was that which I stated. WoW!!!! We gotta ensure equal rights, freedom to ALL , PEACEFUL, trustworthy, PLACE OF LIFE, for NATURE AND NATURAL GOODNESS of LIFE FOR OUR YOUTH!!! SUCCESS, MASS PRODUCTION, continued building/”growing of our sustainable future” is not a good thing, nor something we ‘d chose without “brainwashing” as a whole running our lives, along with many globally. It is a false “dream” / delusion of what “good life” is. It is presented, taught and trained into our children in all directions, starting before we even realize it. It was done to us too. Slowly, but surly, America is falling for all the tricks of evil doers, elite, controllers us and our country& lives and mental freedom/which is our lives! We’re being sent far from any real dreams, opportunities and possibilities of natural, good life, which includes a world for more than just greedy, war prone humans to destroy! As their plot continues to play out, we are not stopping it, nor are we acknowledging the big wrongs of the world. Us in US, are falling for scare tactics, which somehow are resulting in government tyranny acceptance, and in some cases even being tricked into thinking we requested and want this kind of “protection, which is to help us”/ a .k.a. slave us, dehumanize the population, remove values and morals & God from lives, existance… Ect. If one day that works completely, then they’ll probley remove all that was once, which was good, pure, real and of God, and it be removed from history. The same as many events in last 100 years have been removed/altered in the “facts” we’re drilled with growing up. Come on people! All we got a do is God’s’ will, remain humble, do for others, stop being selfish. Dont live for petty, useless, false happiness delusions that hold no value and do not last. God bless all! I just hope we all can get back right without violence to anything/anyone else. It solves nothing. It just is more death, on an already unhealthy planet in need ofnothing but love! Don’t get rid of your wife! The whole point of prepping is to save your loved ones and help mitigate dire circumstances & keep your family safe and fed. The institute of marriage is a God honored institute just like it is to be prepared. Don’t lose sight of what is the most important thing (s) in your life. Educate your family just as many of you have already suggested. I know several people who prep and it’s interesting to me those that do are really good, law abiding-decent people. I feel blessed to have them around me as well as a husband who supports me. We must ban together quietly and with respect to a continuity of the American way of life that has been eroded. Don’t give up! We are here & must stick together. We are not some crazy group of people wishing harm on anyone. We just want to survive and thrive during a crisis. However; that doesn’t mean we are going to standby and do nothing when SHTF. God bless you all during these difficult times. Dave in so Cal, interesting comments about the Dogs. While Operating in Northern Australia with Military, they were a constant problem. As if there weren’t enough “Natural” things wanting dinner at my expense. I should think in a grid down scenario, they would become a serious problem fast. The worst ones we had dealings with were the “overnight release” from domestic dwellings. NO fear of humans and very confrontational. I dont have the spouse or kids, I’m more of a quality vs quantity type and basically just 2 close friends at the moment (I do have some feelers out on some others). 1 was right with me from the start, with very little proding. The other i think still thinks I’m nuts at times. Live in tornado land and lost power for almost 2 weeks once so I started there, that took care of short term preps. The long term preps idea took more time. I’m a person who doesnt give the government to much props and trust, I believe they may have plans for themselves as elites, and wouldnt surprise me if those plans excluded their spouse and children. Anyways when i brought up civil unrest, economy collapse, terror/hackng of power grid etc. All i got was the government wont allow it. When i told him good chance the government will cause the reason to use preps he was like no way. What i think finally got to him was when i asked him if he ever thought he would live to see the day government forces us to allow boys and girls to use same bathroom and showers. Even then he was like how does this effect him, I was like you seriously dont see society breaking down all around us?.. I will say current events have made it where he doesnt look at me like i need commited as often. After Trump won he was like see, nothing going to happen. My preps have not slowed, if anything i kicked them up a notch. I know this is a really old post, but. My spouse refuses to even let me prep. If I buy more than one pack of TP when we have 1 roll left in the house he says I am wasting money. I have tried to get him to understand using the methods above. He still insists, nothing is going to happen. It’s crazy talk.